I need a circuit to monitor nine low-level audio signals with nine LEDs. For example, when there is a signal on input one, LED #1 lights up, when there is a signal on input two, LED #2 lights up, and so on. 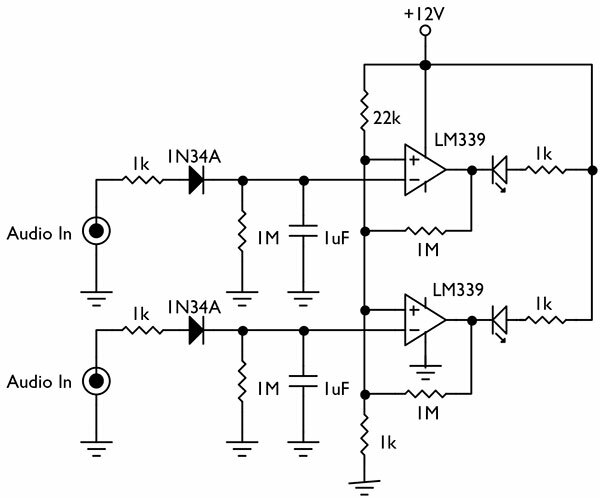 A simple way to do this is with a comparator, like the LM339 (see diagram). The audio is rectified, filtered, and input to the inverting input of the comparator. A 1M feedback resistor introduces a small amount of hysteresis and prevents oscillation. The reference voltage is approximately 0.5 volts. When the audio level exceeds 0.8 volts (a typical preamp audio level), the LED lights. Because of space limitations, I've only drawn two channels. Simply duplicate the circuit to increase the channel count.